A vitamin concentrate, this nourishing oil is ideal for application during the winter on dry skin or for a boosted anti-wrinkle effect. Featuring very high vitamin A content, it works like the ideal complement to a Vita-A-Kombi treatment for reinforced anti-aging action. Apply a few drops to clean, dry skin, leave to penetrate for a few moments. Follow application with your regular Karin Herzog care routine. Apply daily if needed. Great alternative to Additional Sweet. 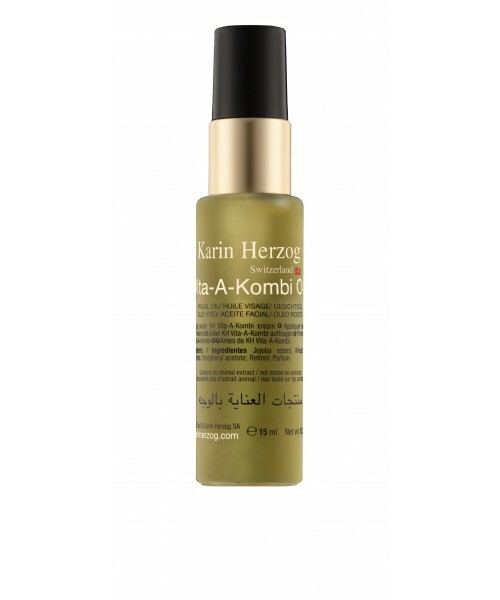 This oil – which delivers a particularly high concentration of vitamin A - is very versatile; it can be rubbed into the nail beds for supple and healthy nails but also be applied underneath an eye cream or on the lips, to plump, hydrate and repair. Sesamum indicum seed oil, Tocopheryl acetate, Retinol, Beta-carotene, Parfum.